Building a Farrier designed F22 (www.f-boat.com) in the Netherlands. 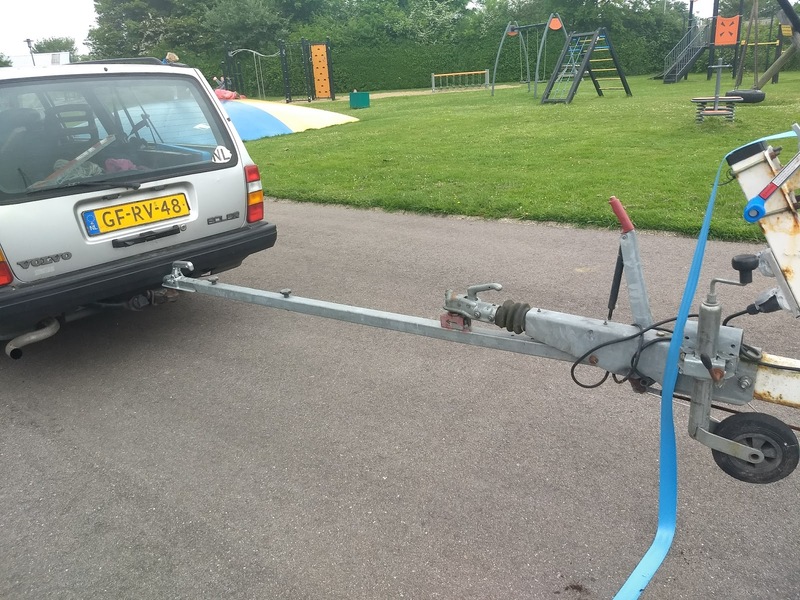 After having my car sliding from a slippery ramp half into the water I thought it was time to make a trailer extension to be able to get only the trailer and not the car in the water. 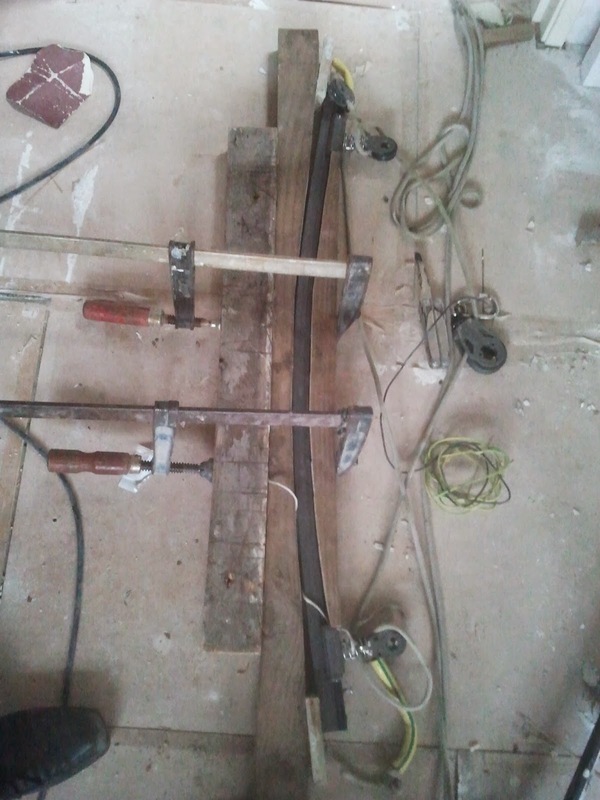 It's put together with some galvanized steel square tube and an extra trailer hitch ball. The extension has a reces at the far end which slides over a bolt in the tongue-assembly (the bolt is the rusty bolt near the parking-brake-lever). 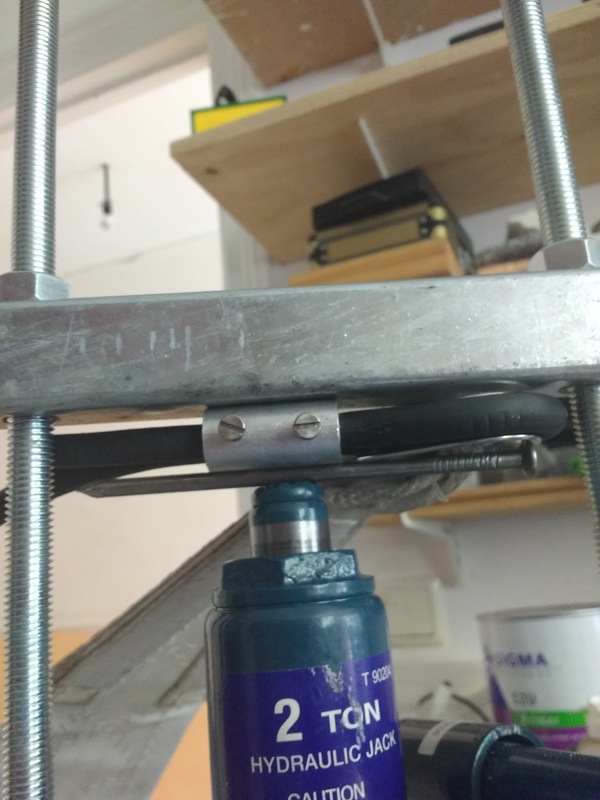 The extension bar locks on the ball by just lifting up the car-end of the extension. To carry the extension there is a ball on the trailer and a u-frame on the first crossbar: the back end of the extension lies in the u-frame and the front end is fixed by clicking it on the ball. 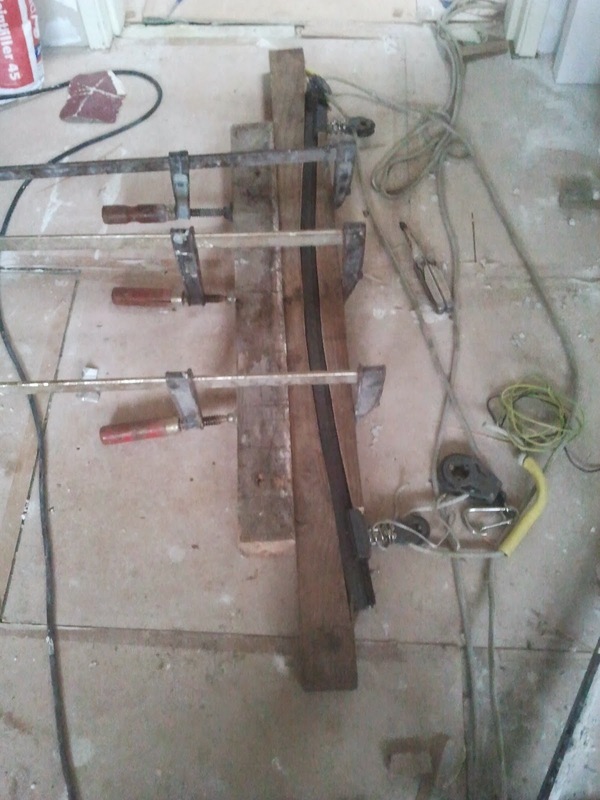 It works, although I always find the forces on this kind of equipment a bit daunting. Especially when the trailer is half way in the water and the back of the boat is already floating, the forces on the front end of the trailer which carry the rest of the weight of the boat must be quite high. 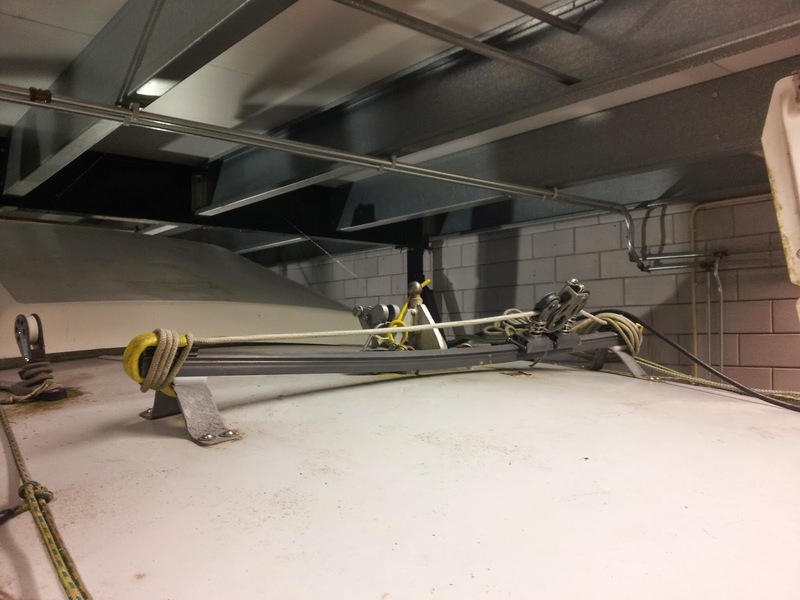 Next: antifouling with finsulate wrap. Until recently I always had to put in or remove the top batten of the mainsail when hoisting and dropping the mainsail. On internet I found a very easy solution to keep the batten in the sail. 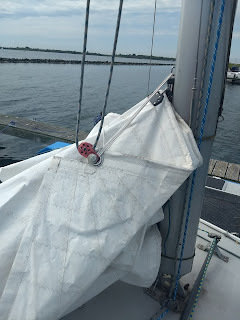 Tackle is tightening and will be tight with sail hoisted about two meters. 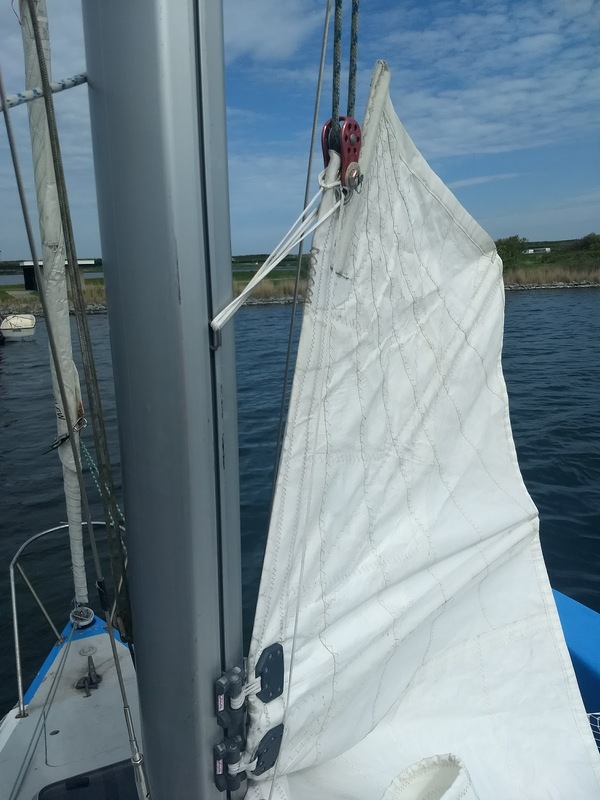 First I had doubts it would work, but at least for my size of sail it does. 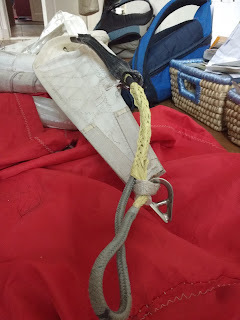 The dyneema rope is slippery enough to not get stuck and the topslider doesn't get stuck either. 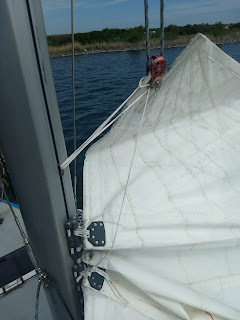 By the way: the top block on the mainsail is a climbing block: very strong, light and durable and way cheaper than sailing-blocks. 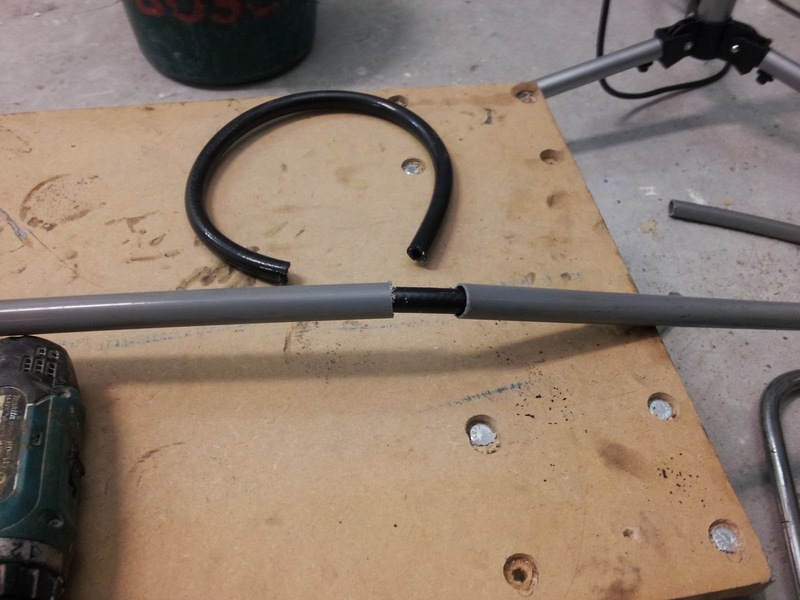 New anti-torsion cable - PERFECT! 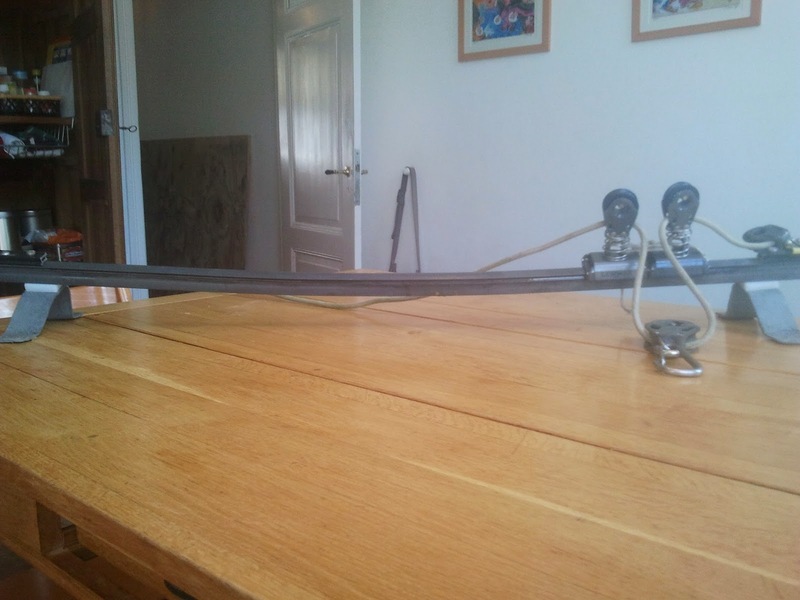 The standard anti-torsion rope on my jib has never impressed me much. Especially with a lot of wind, when you need it to work, it doesn't. 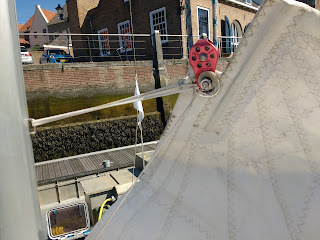 The top of the jib would not furl because the line was not stiff enough (and probably because there is relatively little tension on the anti-torsion line compared to fixed mast-boats). I replaced the line with Harken Reflex anti torsion rope. 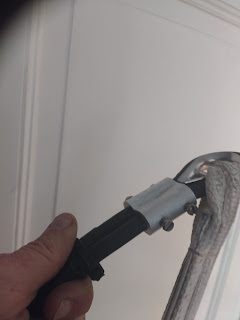 This rope is a normal anti-torsion rope but with a braided stainless steel cover round that rope. What a difference! I am usually a bit sceptical about claims of new products, but this works perfect for my setup. 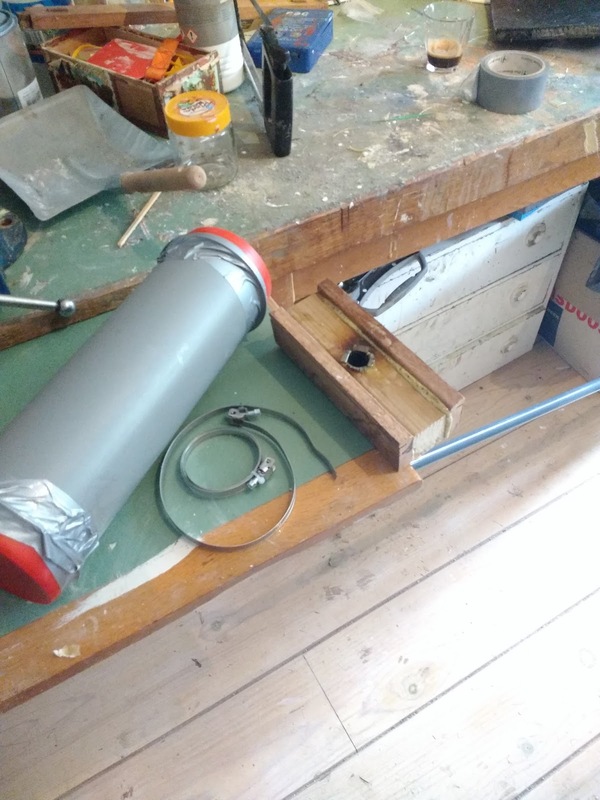 The rope can be bought with expensive end-terminals, but I made them very cheap with aluminium press-sleeves, just for the fun of trying to replace some stuff with diy-parts. For extra security i tapped some m5 machine screws into the press sleeve to further lock the cable, but in hindsight this is overkill. My cheap trick to press the sleeves, step 1: put sleeve in a vice with to big steel nails as 'press die' to (pre)form the sleeve. .... to knot my own bow nets. I extended the nets a bit by using the all purpose-eye on the float to support the net. Knotting the nets was good fun. 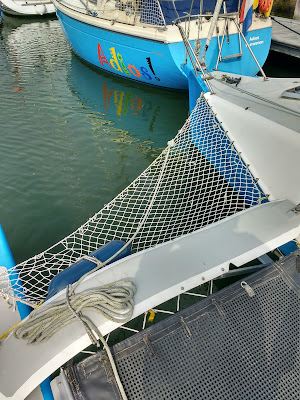 I use the nets to store fenders, to attach the front mooring-line, and as some extra security while moving on the boat. Plus my children and wife like to use them to hang out while sailing in calm conditions. 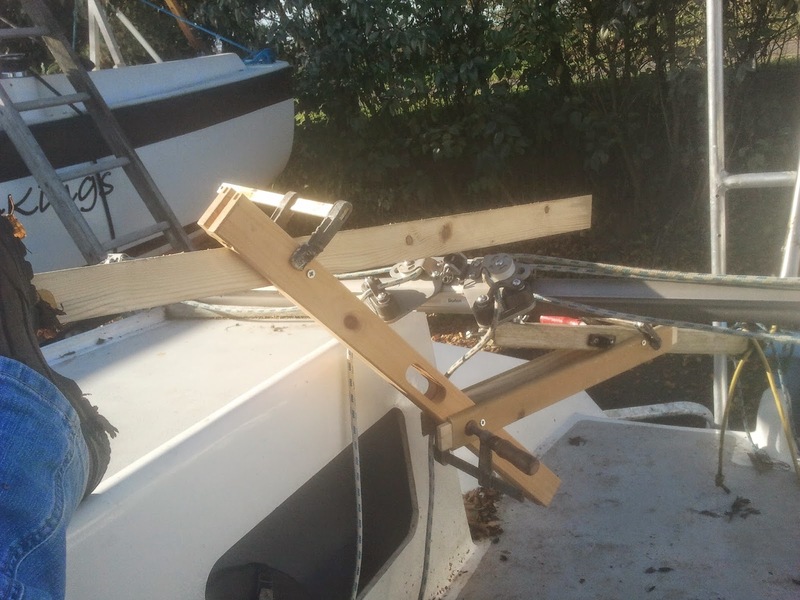 After my last post I dit some work on the boat and the trailer but my Phone with the pictures crashed. I will make some pictures of the trailer shortly and put them on my blog. My anti fouling is not up to the task of keeping the bottem clean enough. 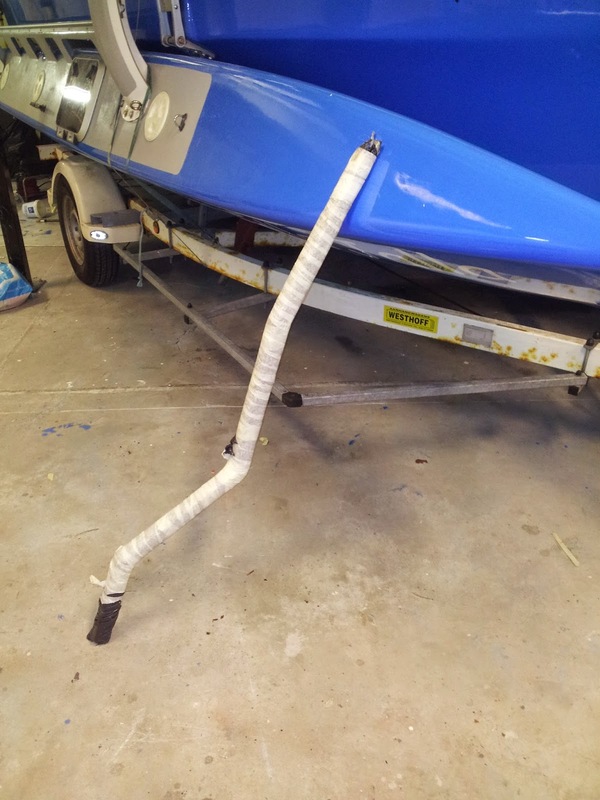 As an alternative to getting the boat out of the water and on stands to clean the bottom (can't do it on the trailer because I made the 'farrier-style' fitting tub on the trailer so most of the bottom is not in reach while on the trailer) I made a 'floating scrubber' with some pvc pipe, wood and a piece of doormat. I didn't try to build it to last a long time, only to see if this idea would work. 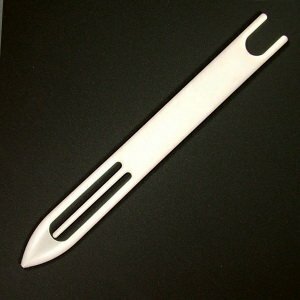 The idea is the bend stick allows you to reach the whole bottom with the scrubber, while the buoyancy provides enough force to effectively scrub the bottom. 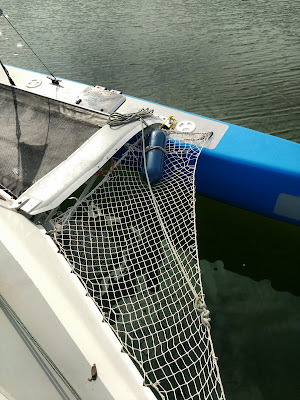 I used the scrubber while sitting in a small inflatable boat and it worked quite well. 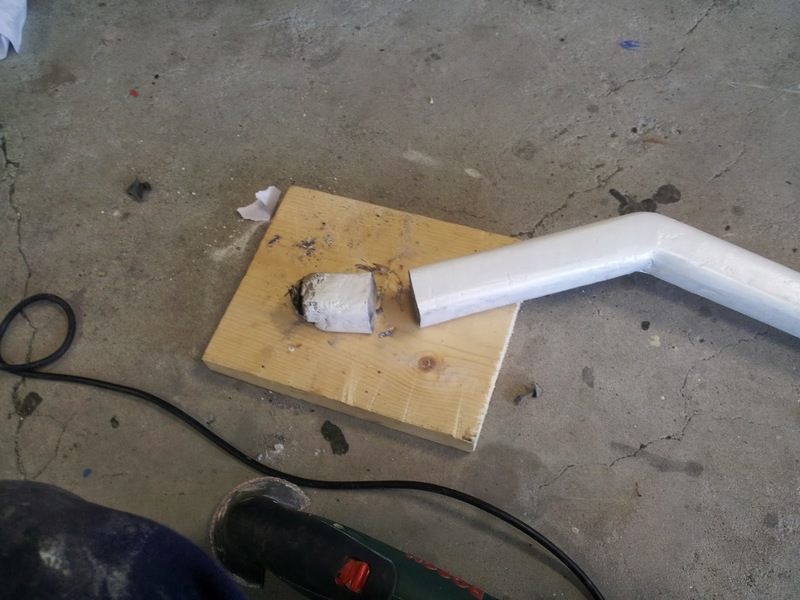 The scrubber was a bit too bouyant; I'll make another version with a bit smaller piece of PVC pipe and that will probably become my scrubber for the coming years. Unfortunately it didn't get all of the fouling off, which was not a big surprise. The boat has been in salt water for over two years now. 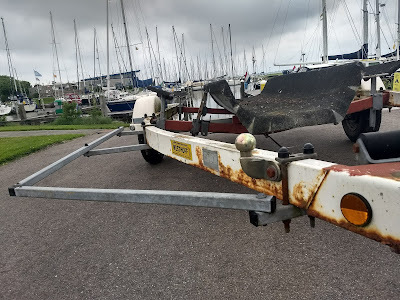 End of season I will get the boat out, do a very thorough cleaning and anti-fouling. 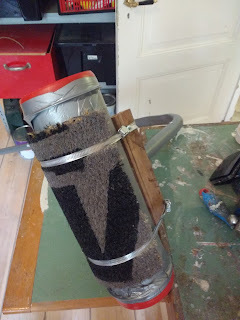 After that I will use the scrubber as an extra to keep the bottom tidy. The way the rudder cassette on the F22 is designed is probably optimised for a boom-ed mainsail with the traveler in the middle of the cockpit. With a boomless main the traveller is at the end of the cockpit, and a straight tiller is sticking too much 'up' to pass under the traveller. I made a 'frankenstein-mock up' of a tiller with enough bends to move under the traveller with enough space to make sure the main sheet won't interfere too much with the tiller. 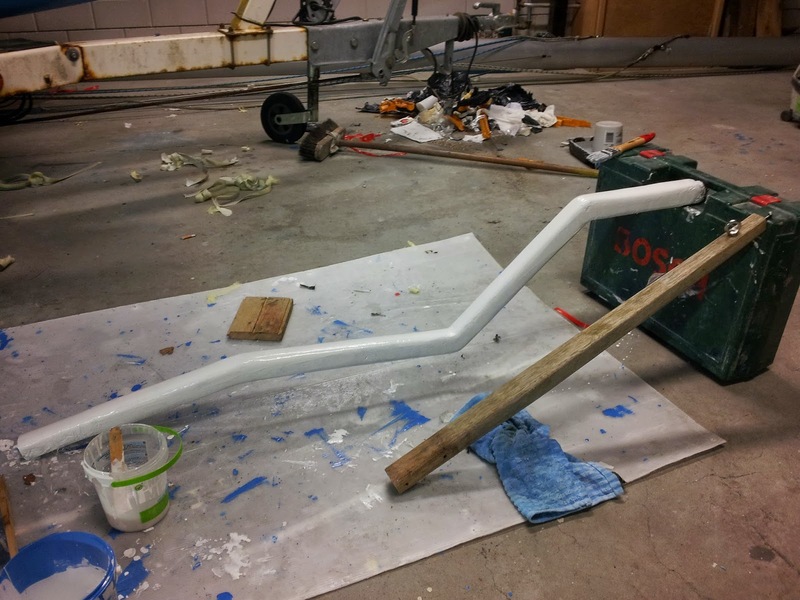 Frankenstein mock up attached to the original short tiller. I used FEM analysis to calculate the thickness of carbon UD -sure... but only in my dreams. In reality I just put some tapered carbon UD leftovers on top and bottom of tiller and will see if it works. Tiller will subsequently be wrapped in some 200 gr glass tape. I have never managed to find a good way to laminate/wrap round objects/parts. 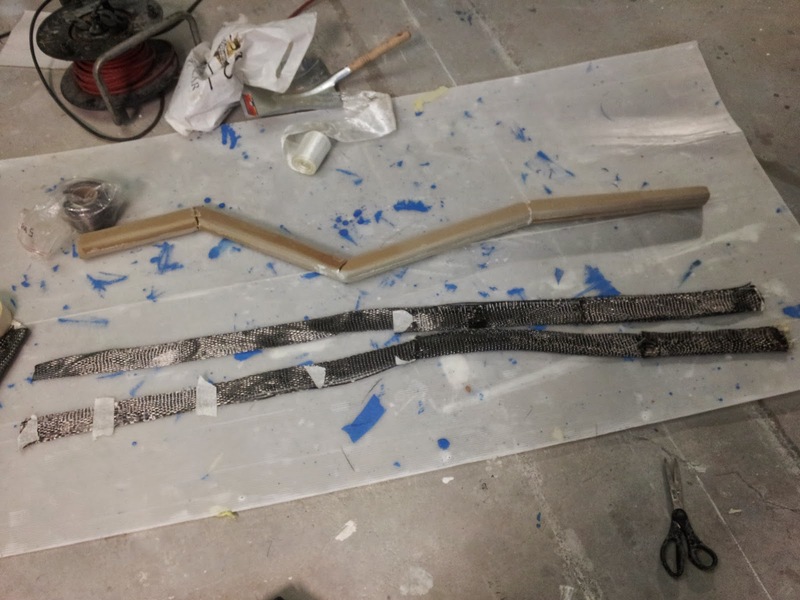 This time I laminated the tiller and pressed the laminate by wrapping it in pieces of plastic and securing this by wrapping the whole tiller with paint-tape. it worked (no bubbles) but the laminate was quite rough/uneven. 'bagging' with pieces of plastic and paint-tape. 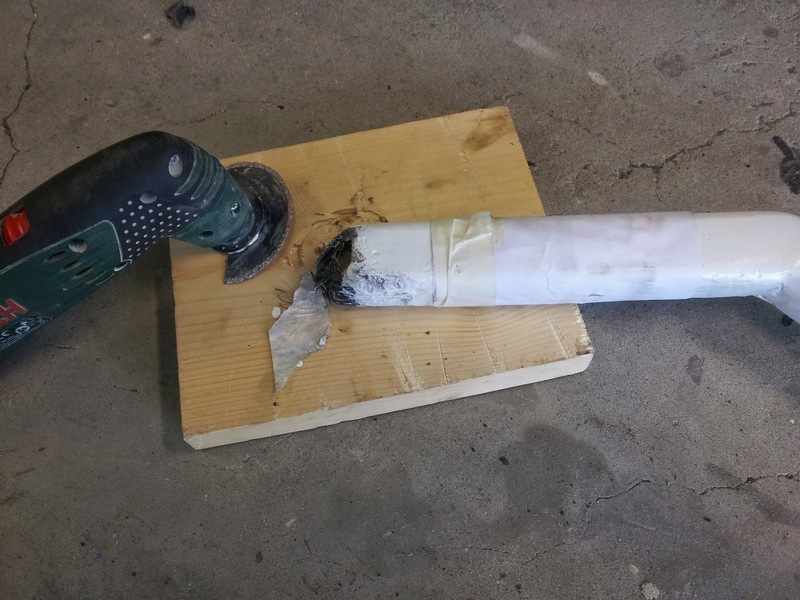 A tip I won't stop to repeat because it was such an eye-opener for me: use tile-cutting blades in a jigsaw or even better on a 'multimaster' type of saw to cut fiberglass. Blades last forever and hardly any mess and itching glassdust. Below the old and the new tiller. 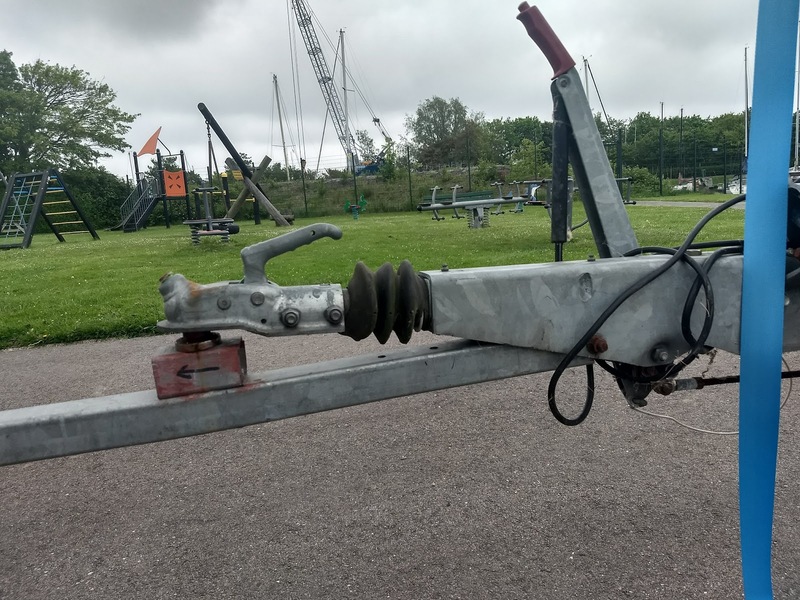 The new tiller is quite long, I hope it can withstand up-down forces if someone accidentally falls on it because it is a quite hefty lever. Using expensive and heavy joysticks on the F22 is a waste of money in my opinion. 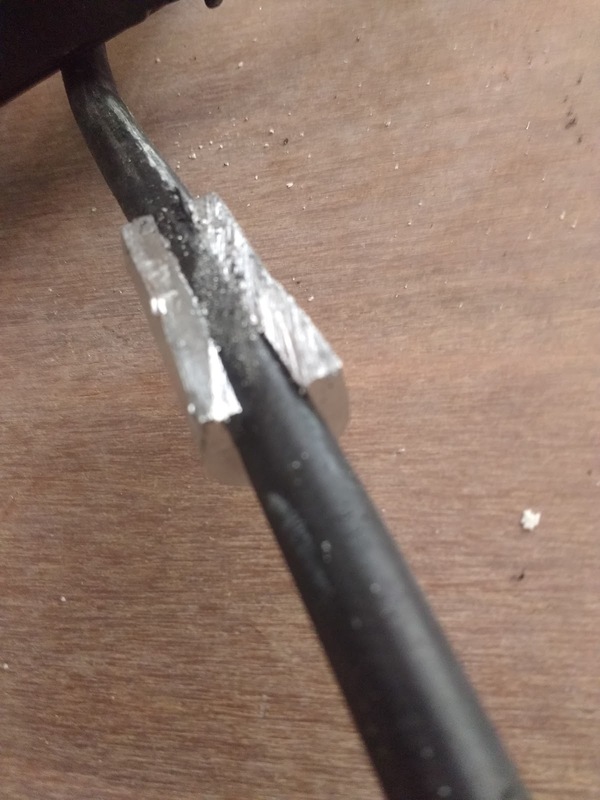 Cheapo grey pvc elektricity pipe works great: it's light, a bit flexible and most importantly it doesn't damage the paint of the boat when it's laying around in the cockpit. End result below. 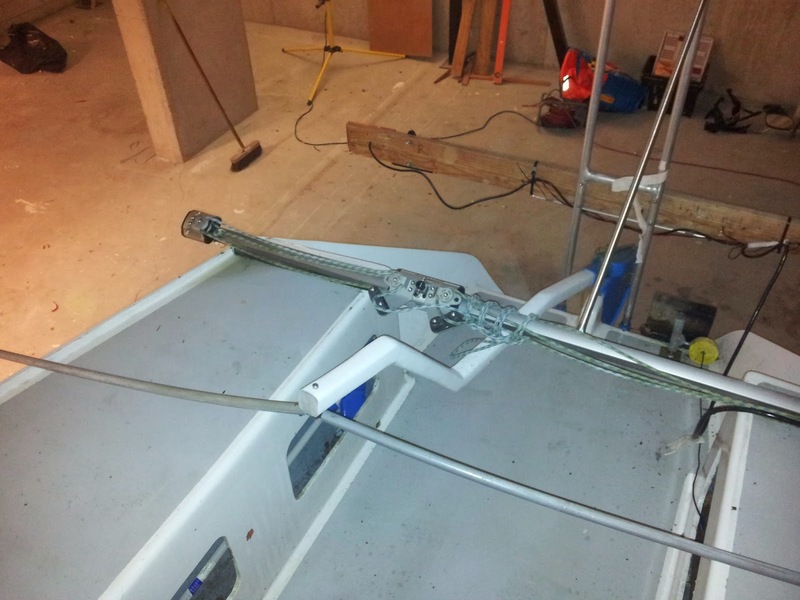 I will first test the tiller and see if it works in real life, if the joysticks are mounted at the right spot etc. After a long pause it is time to update my blog a bit. Unfortunately I lost some photos of last years, but luckily there are enough left to show most of the progress & projects. I put a self-tacking jib on my boat (very nice for easy cruising, although not so efficient for going downwind as top of the jib twists too much because of the way the jib is sheeted) and originally I made a straight traveler. I thought this would work because with a straight traveler the jibsheet has maximum slack when going from one side to the other. I was wrong: with a bit wind the cars of the traveler would stop about 15 cm before the end of the traveler. So.... I had to put some radius in the traveler. 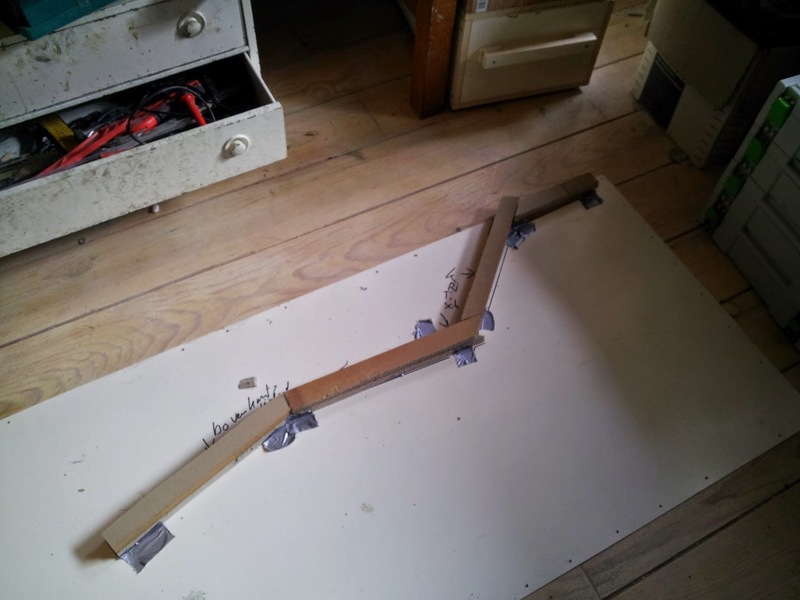 On internet there are some very nice examples of people making bending jigs for travelers, this one is my favourite. But sometimes it's better to do it the easy way.... 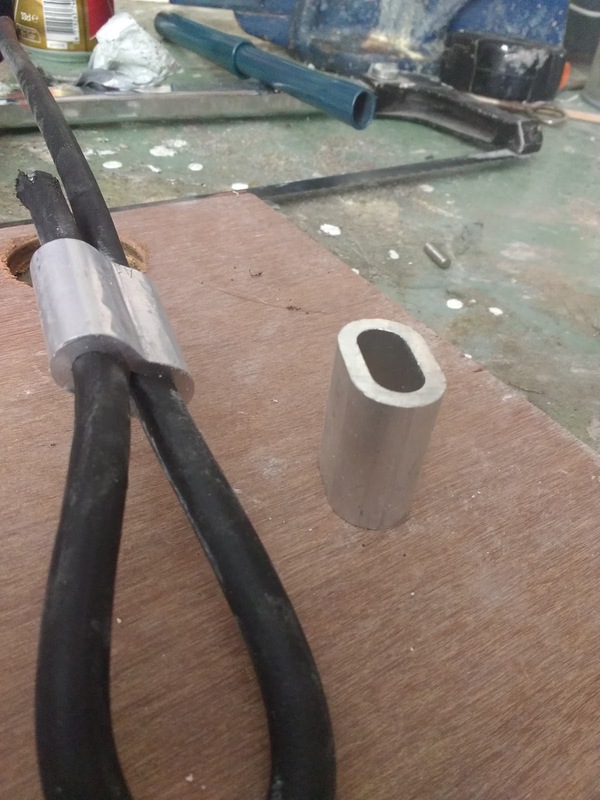 I just guesstimated the required radius (taking into account some springback) and used a band-saw and a piece of timber to make a 'mold'. 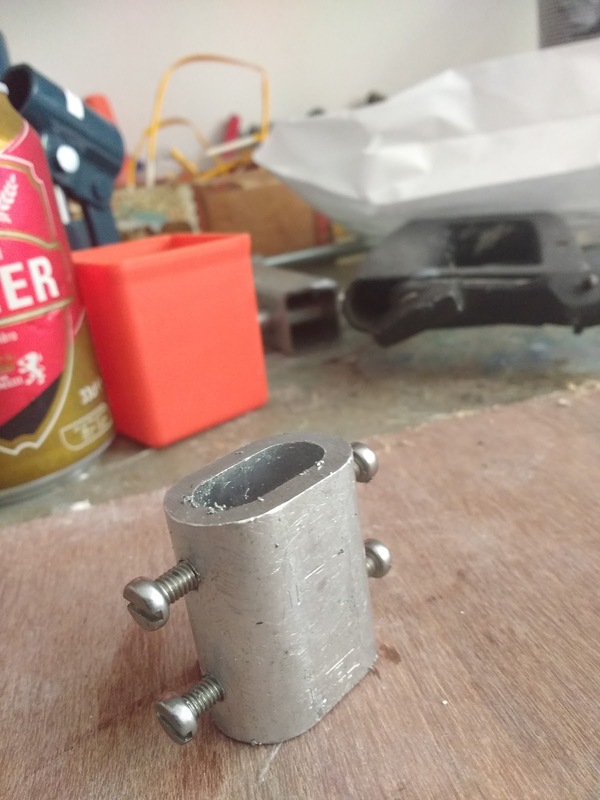 .... it turned out my guess of the springback was too conservative, so I just used some extra pieces of wood at the end of the traveler to increase the radius of the bend some more. Succes! 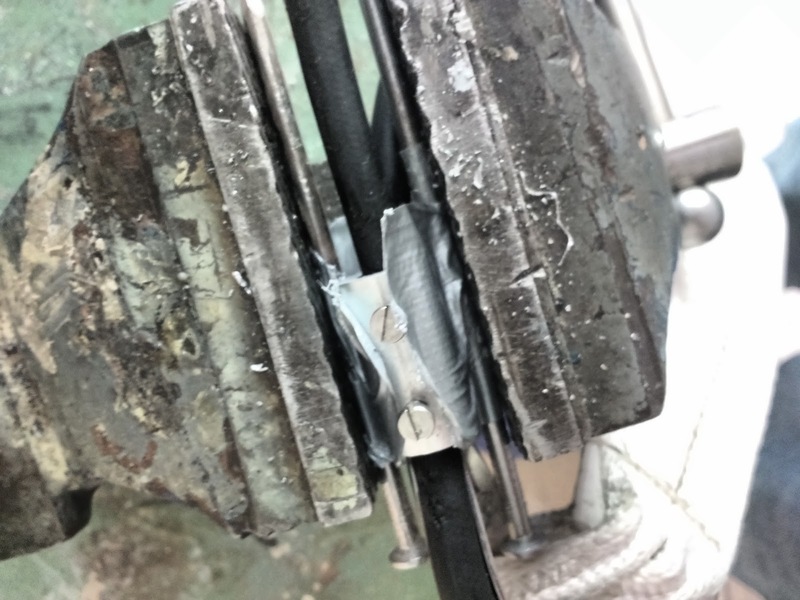 This slight bend of the traveler made a big difference: jibsheet travels without any problems from one end to the other, every time.